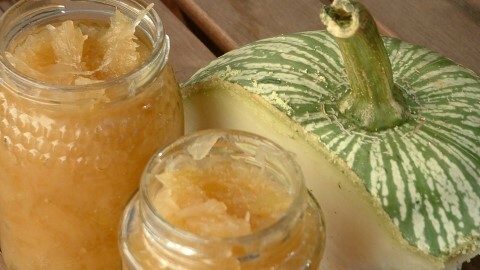 The long, yellow fibers inside a pumpkin likely account for the name of this preserve, cabello de ángel, or “angel’s hair.” Whatever the origin of the name, this wonderful preserve is popular all over Spain. It is mainly used as a filling for turnovers like robiols, pastries like ensaimadas, cakes, and other sweets. This recipe is a simplified version of the more time-consuming original formula, but it works well. You can use any flavorful winter squash in place of the pumpkin. Just make sure that it has the bright yellow-orange flesh. Start preparing the preserve the day before you need it, as the pumpkin should rest overnight. Halve the pumpkin and remove and discard the seeds. Carefully remove the fibers from the center of the pumpkin and reserve. Peel the pumpkin and cut it into small chunks. In a saucepan, combine the pumpkin chunks and 1 cup of the water, bring to a boil over high heat, boil for 1 minute, and remove from the heat. Drain the pumpkin well, place in a bowl, and add the reserved fibers, the sugar, and the citrus zests. Mix well, cover, and let rest at room temperature overnight. Transfer the pumpkin mixture to a nonreactive sauce-pan and add the remaining ½ cup water. Place over medium heat and bring to a boil. Decrease the heat to low and cook, stirring constantly with a wooden spoon, for about 30 minutes, or until the pumpkin chunks have broken down and the fibers are no longer stringy and are fully incorporated. Remove from the heat. Let cool, transfer to jars with tight-fitting lids, and store in the refrigerator for up to 1 week. 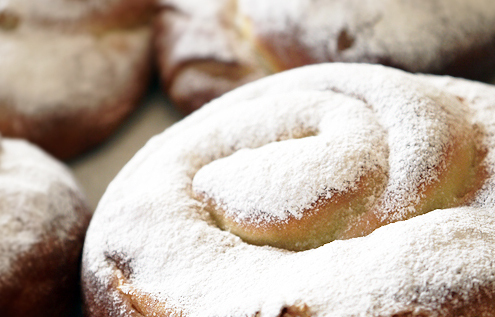 Ensaimada (Majorcan Sweet bread): A Majorcan favorite, ensaimadas are warm, yeast-based cakes fashioned into round, coiled shapes. Although delicious, these cakes are time-consuming to prepare, because the dough must be allowed to rise several times. 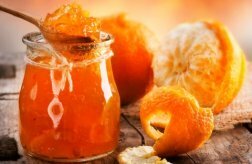 Mermelada de naranja ácida: England has long been recognized as the source of some of the world’s best orange marmalade. Until recently, the bitter oranges the English used were grown in the public parks and streets of Sevilla. Picking oranges from the city’s orange trees was strictly forbidden, and fines were handed out to those who dared take the precious fruits. The entire harvest was shipped to England by virtue of a contract between the municipality of Sevilla and major English marmalade producers. Occasionally, an officer could be bribed to look the other way while five or six oranges were picked, which is just the amount needed to make this recipe.